It's tough being a puppet these days. After what seemed like a surefire return to puppet glory with 2011's The Muppets, 2014's Muppets Most Wanted ended the cinematic Muppet momentum, and their 2015 TV series tanked. So, with the stalling of The Muppets franchise, it seemed like a good time for a former Muppet stalwart, Brian Henson (son of Muppet founder, Jim), to take puppets in a more adult direction. After all, father Jim had a more adult incarnation for The Muppets in mind way back in the '70s when they appeared on the first season of Saturday Night Live (It's true!). A raunchier band of puppets would seem an OK addition to the Henson legacy. 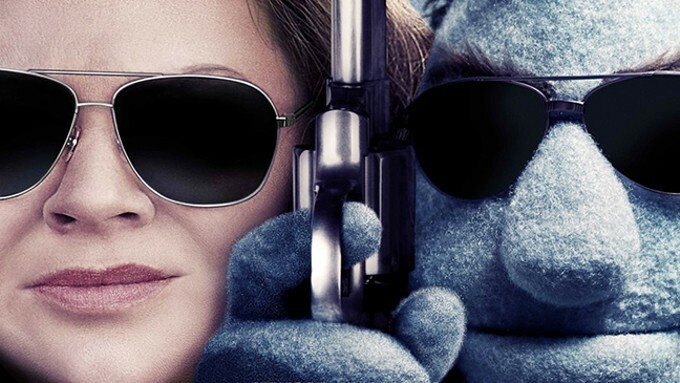 The Happytime Murders is not a Muppet movie, it's a Brian Henson puppet movie, a product of Henson Alternative, an "adult" branch of the Jim Henson Company. The public will not be hankering for more adult puppet shenanigans after watching this listless, joyless, humorless exercise in how not to make a puppet movie. The film is set up like your standard puppets interacting with humans Muppet movie, but Kermit and company are banned from the set in favor of bland, seriously unfunny puppets that fail to distinguish themselves in any way. Brian Henson directs, his first big-screen directing gig since Muppet Treasure Island, and it's a lost puppet cause. Henson's directing chops have not aged like fine wine. They've aged like something more akin to a mango that got lost in the back of the refrigerator six months ago. Melissa McCarthy, having a disastrous year with this and the terrible Life of the Party, takes the lead human role as Detective Connie Edwards, former partner of puppet cop turned private investigator, Phil Philips (voiced by Bill Barretta). The two find themselves teaming up again when puppet cast members of '80s TV show The Happytime Gang start getting the cotton pulled out of them in a series of visually uncreative deaths. OK, the one puppet getting shredded by band of dogs led by a Boston Terrier made me chuckle a little, but it's only because I have a Boston Terrier currently living in my home, and I'm pretty sure she would shred a living puppet if given the chance. While there are hints of some funny premises to be had (Connie got a puppet liver transplant, so she's tragically addicted to sugar), none of them are taken to fruitfully funny extremes. That's because writer Todd Berger's screenplay thinks something should be a laugh getter just because it's naughty. There's no room for wit or depth in his land of puppetry, just F-bombs and silly-string ejaculate. Frankly, I'm surprised the film doesn't have an overload of puppet farts. Puppet farts might actually be funny. They'd sound like wind passing through sheets left out on a line to dry on a sunny summer's day. Other human actors looking totally lost include Joel McHale as an FBI guy (I couldn't help but notice that McHale's hairpiece/transplants look less convincing than the hair on the puppet heads). Maya Rudolph fares a little better as Philip's human secretary, but Leslie David Baker appears to be in serious pain delivering his typical police chief lines. Elizabeth Banks gets the worst gig as Jenny, the only human member of the Happytime Gang, forced to make out with Philip. Let it be known that I, above many, was very much up for some nastily funny puppet activity. I still think Team America: World Police is one of the 21st century's funniest movies, and The Happytime Murders had good people involved. I'd say nothing good comes out of The Happytime Murders, but maybe its failure will create an old timey hankering for the return of Kermit and friends. Something tells me if McCarthy gets a script for a new Muppet movie by courier in the future, she's going to kick that courier in the nether region. DC turns out its best superhero flick since Wonder Woman with Shazam!